I thought it was an easy one, just cleaning and sharpening : I was wrong :?! This takes me to the point : I need a tap set. So now I don’t know what to look for !!! I don’t think that’s a correct rod. 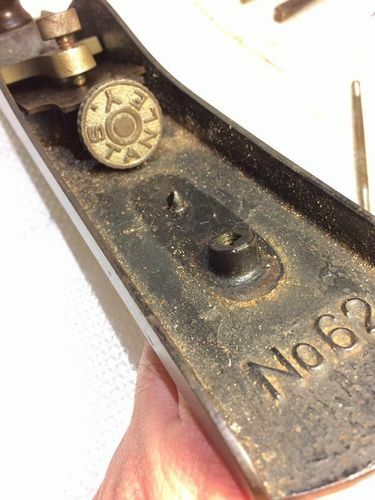 62s had a headed bolt, not the brass/steel combo used on the bench planes. And I believe Don W. has a references post for all things Threads… if not Don, then Wayne C here on LJs. I defer to smitty. Pretty sure he has one and I’ve never seen one in person. Fridge, I think he’s saying you’re right (Wayne’s post you link agrees with you), but that the rod Mikey has is not 12-20. 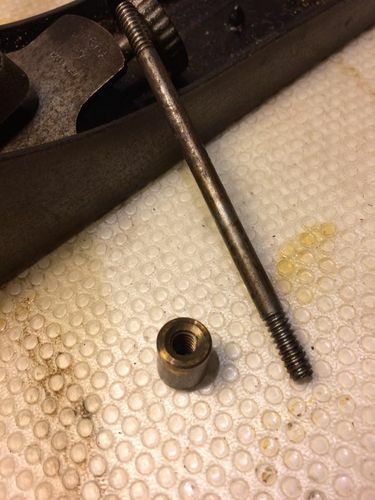 I do think that no matter what the thread on that plane is, it would be better to make a new rod than to braze up the hole and drill and tap. Sorry, didn’t see Fridge’s post, must have been crossing in cyberspace when i hit SUBMIT on mine. Anyway, yeah, nothing inconsistent between the two comments. Tim nailed it as well. Typically just running a 1/4-20 tap and making a new bolt will work, but there are many ways to skin this cat. Thankyou very much Don for helping !!! I’ve never seen/noticed a stanley plane tote coming with that style bolt !!! 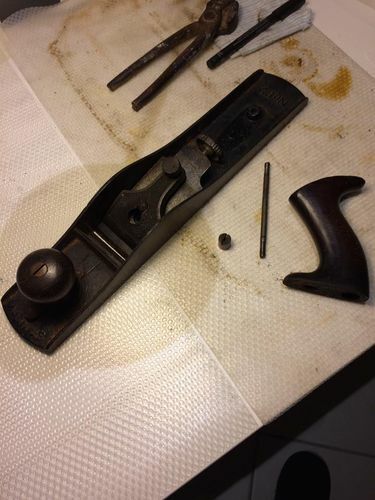 my plane (as you can see from the 1st picture) hasn’t got the headed bolt, but the more common brass/steel combo used on the bench planes …. Is your 62 older than mine ? Is it more recent ? or is just that I’ve the wrong combo ? Please guys let me know, I’m Italian and do not have chance to go to antique shops/markets to make research on the field, I fully rely on your knowledge !!! The #62 isn’t nearly as abundant as their bench planes, so I can’t say I’ve worked on a bunch of them, but both mine and Smitty’s have the similar bolt. It will take a bit more research to know for sure. 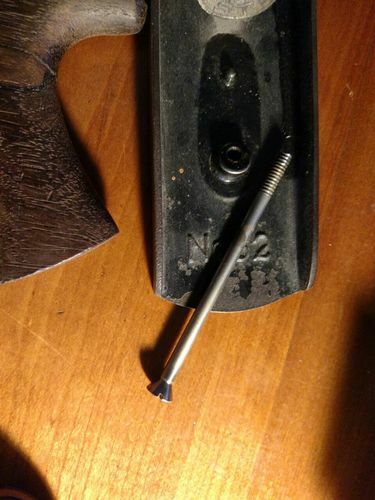 A few years ago there was a tool galoot selling 12-20 tap & die to help with Stanley repairs on eBay. But Dr Google tells me you can get custom pitch 12-20 tap from Victor? I get mine from Victor. Buy 2 and grind the end to make a bottom tap. Before I brazed it, I would just solder the bolt in place. But again, just another way to skin the cat, and of course that would only work with the nut end kind. I’ve sent a mail and shipping for a couple of taps it’s quite expensive , 42$ delivered to italy plus 21$ for 2 taps . I’ll see if I can find some in Europe. In the meantime I’ll send a mail to Patrick Leach and see what he knows about 62 and tote bolts. Before I brazed it, I would just solder the bolt in place. Just because of the different lenguage could you explain it (“solder”) better ? Solder is to melt a low temperature metal and use it to connect to things together. Like you would do to connect two electricl wires, or connect copper pipes. Unlike welding the metals aren’t melted together. The flowable metal just takes up the the open space and when it solidifies everything is locked in place. Unlike welding the metals aren t melted together. The flowable metal just takes up the the open space and when it solidifies everything is locked in place. Which requires a lot less heat and less chance of warping your plane.